An adaptation of Frank Miller's graphic novels, Sin City is an artistically stunning anthology crime thriller. With every frame a stylistic triumph, the film jolts the comics to life, ironically in a grim and crime-infested city where life is cheap and hope goes to die. After a brief prologue featuring an assassin (Josh Hartnett) and his target (Marley Shelton) at a rooftop party, the film features three loosely related stories, with the adventure of detective John Hartigan (Bruce Willis) split into two chapters. With his heart close to failing, Hartigan is about to retire, and as a final mission sets off to rescue 11 year old Nancy Callahan (Makenzie Vega) from child killer Roark Junior (Nick Stahl). Hartigan's partner Bob (Michael Madsen) tries to convince him not to go through with it, but Hartigan is determined to end his career with a bang. The film's final major chapter returns to this story, with Junior identified as the son of Senator Roark (Powers Booth), and a grown-up Nancy (Jessica Alba) still in peril. In the second story, ugly brute Marv (Mickey Rourke) is enchanted by prostitute Goldie (Jaime King), but finds her dead in his bed after a night of passion. Marv bruises his way through town to identify the killer, a revenge quest that involves his parole officer Lucille (Carla Gugino) and Goldie's twin sister Wendy. The trail leads Marv to maniac cannibal Kevin (Elijah Wood), who is protected by the all-powerful Cardinal Patrick Henry Roark (Rutger Hauer). The third story takes place in Old Town, where a group of prostitutes rule the streets. Gail (Rosario Dawson) is their leader, and her man is Dwight McCarthy (Owen Wilson). When a gang of thugs led by corrupt cop "Jackie Boy" Rafferty (Benicio del Toro) first intimidate Shellie (Brittany Murphy) and then Gail's girls, a bloodbath ensues, with silent martial arts expert Miho (Devon Aoki) having a field day. The carnage destroys the fragile balance between the working girls and the cops. An epilogue again features the return of the assassin, as well as Becky (Alexis Bledel), one of Gail's girls. Co-directed by Frank Miller and Robert Rodriguez with Quentin Tarantino credited as a special guest director, Sin City is a visual feast of cinematic artistry. Filmed in black and white but with isolated splashes of vivid colours, the film dives into the deep end of adult graphic novel territory, where extreme violence is a shortcut to every problem and every scene threatens to end with a gory punctuation mark. To survive for any length in this milieu, the men possess superhuman strength, and the women use a combination of weaponry and seduction to carve out their territory. Heads are routinely bashed or severed and body parts are chopped off for fun: Sin City has no pretense of law and order and film is not for the faint of heart. Across all its stories, Sin City easily lands its punches on traditional targets: politicians and priests are the symbols of corruption hiding behind dirty veils of authority, literally spawning and protecting generations of evil and mayhem. Prostitutes (Goldie, Gail and her entourage), cynical but honest goons (Marv), righteous killers (Miho) and honest cops willing to bend the rules (Hartigan) are the heroes of Miller's world. Men propelled into action to protect or avenge women, who may or may not need help, is a prevailing theme powering the film. Hartigan's final mission is to rescue Nancy; Marv will tear up the town in memory of the only woman who was ever nice to him; and Dwight risks his life to try and save the ladies of Old Town from annihilation. The Old Town segment is relatively the weakest, Dwight and the gaggle of girls tangling with Jackie Boy never quite clicking as individual characters worthy of attention, and a few too many mob and mercenary baddies show up to muddle the objective. Jackie Boy himself and the dialogue-challenged Miho emerge as the most memorable contributors, which probably wasn't the intent. In contrast, the Marv story works best and is delivered as pure cinematic gold. 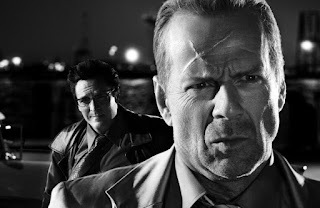 The relentless revenge quest of a most ugly man perfectly fits the film's dank soul, his indestructible forward momentum cutting a swath through sin city and all the way to its religious core. Mickey Rourke as Marv has never been better, transformed into a half-monster yet with his damaged moral compass somehow still functioning. Slick, hyperkinetic and cynical to a fault, Sin City is an enthralling experience.